Services - London Business Machines Inc.
Now offering In Shop and On Site Computer Repair of all Brand Names. Click Here for our Competitive Rates! Our Service Technicians are professionally trained. 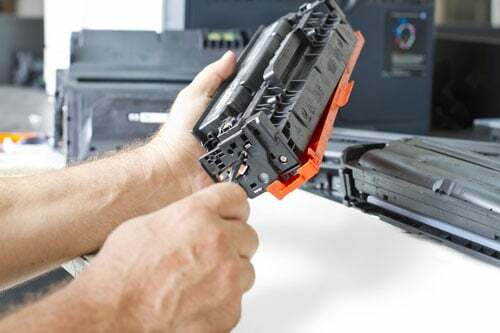 We fix most brands and models of Office Equipment including Printers, Copiers, Multifuction Machines, Fax Machines, Dictation Units & Shredders. Please note that estimate fees are charged. In Town On site estimate fees are charged at one full hour + tax. Out of town estimates will also be subject to travel time and mileage fees. A valid credit card number needs to be provided when call is placed. Any estimate fees will be deducted from the final bill should the repair be approved. In shop estimate fees (customer drops machine into our location) will be charged out at ½ hour. Estimate fees will be collected at time of drop off. Estimate fees will be deducted from final bill should the repair be approved. We offer “You Shred” services of your office and home documents. For a low cost, you can bring in and shred your own documents – total security, as you are the only one handling your documents. * for an additional cost, we can do the shredding for you. Call or Fill out the form below. A LBM technician will return to you as soon as possible.